Editor’s note: Little has changed since Jonathan Agin penned this article for the Huffington Post in February, 2013. There are many amazing charitable organizations focused upon cancer research and support. Most of us can rattle off the big ones from the top of our heads. It is a crowded market and thus, when making decisions as to which organizations to support, you should know where the money is going and how those foundations market themselves. In the childhood cancer community, we are fortunate to have many really strong foundations that are doing amazing work. We just need to learn how to collaborate better. Unfortunately, there are some foundations that try to occupy the arena with nothing more than smoke and mirrors. One such entity is the American Cancer Society (ACS). ACS is one of the largest, if not the largest cancer foundations on the planet. They have done amazing work in the space of cancer by leading the way on many fronts. 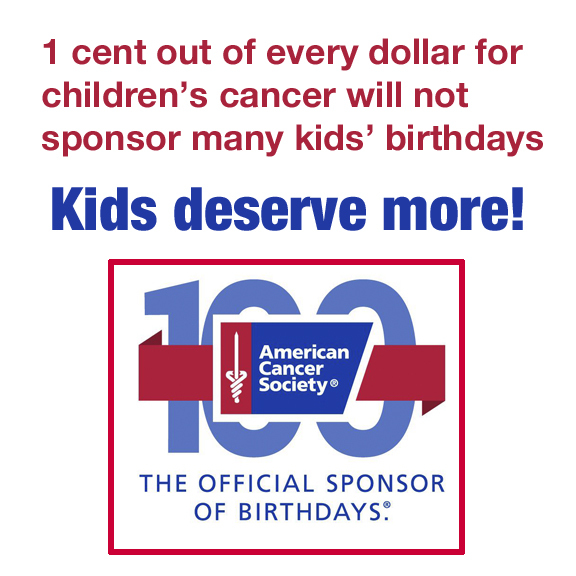 Where the ACS should bow their heads in shame is when it comes to childhood cancer. Their track record of funding for childhood cancer is frankly deplorable despite the manner in which they utilize children to draw donors and participation in their events. 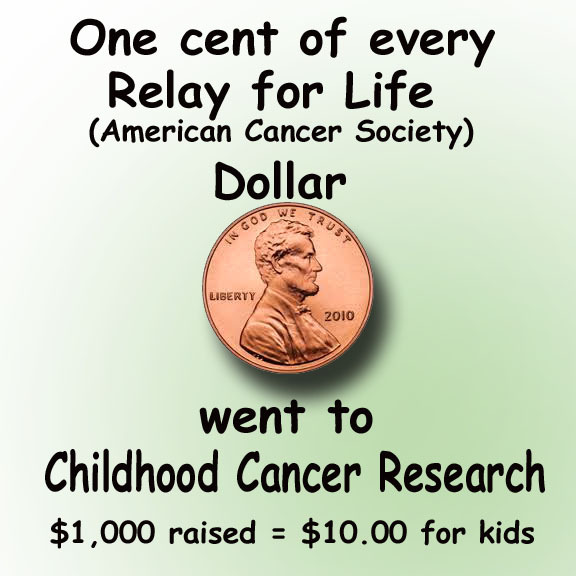 For every dollar that ACS raised in 2010, only a single penny was spent on childhood cancer. Another calculation has this number placed at one half of a penny. That is rather dismal given the amount of advertising that ACS does utilizing children. Many people participate in the signature event of Relay for Life. We have all seen signs and posts on various social media seeking participants and donations for this event. I personally have made donations. Thousands of amazing people specifically host this event thinking they are making a contribution to the fight against childhood cancer. This could not be further from the truth. Those who do put on this event ultimately should understand how little of their efforts go towards helping children with cancer. Literally, a penny or half of a penny on each dollar. In addition to the lack of funds directed towards childhood cancer, ACS recently cut programs that specifically were aimed at benefiting children with cancer. The stated purpose of dropping these programs, as alleged by ACS, is to ensure that a cure for cancer is found sooner. The cut in these programs will effect children with cancer and college students who had cancer. Yet another example of how ACS simply utilizes children to attain significant wealth and then ultimately forgets all about the smallest warriors. This should come as a surprise considering the amount of money that ACS has on hand. If you take a look at ACS, you soon understand that they are simply being intellectually dishonest on several fronts. 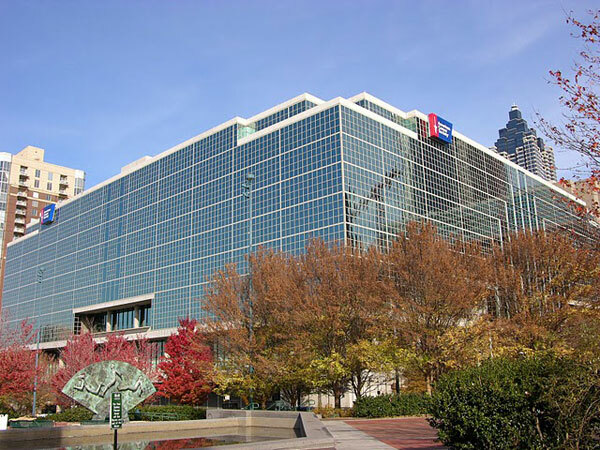 ACS is one of the wealthiest charitable organizations in the world. With over a billion dollars in net assets, it is a behemoth among cancer charities and all other organizations for that matter. Much of ACS’s spend goes towards overhead. The CEO of ACS is well compensated for his efforts at keeping the organization as the giant on the cancer block. It must be a difficult job creating all this wealth. ACS spends a significant amount of time defending itself from media missteps. Take for example the internet campaign to create a “Bald Barbie” to help little girls with cancer. Andrew Becker, the Director of Media Relations for ACS caught wind of this grassroots lobbying. Without giving it a thought, he took to his blog and created a firestorm for ACS with his criticism of the activism behind the campaign. Thankfully he apologized, but not before the damage was done for ACS. Regardless of what you think about the underlying campaign, Mr. Becker’s piece highlights the fact that ACS is not an organization that supports the fight against childhood cancer. The point I am trying to make here is not that ACS is an evil empire. To the contrary, although it may seem otherwise from my words. I am simply trying to provide information to arm people to make enlightened decisions where to donate money or raise funds and who to support. If your goal is to direct funding towards childhood cancer, whether in a support role or for research, my suggestion is to look beyond ACS and check out other organizations. The answer exists in black and white and the numbers do not lie. To ACS, I would ask that you discontinue your intellectually dishonest campaign that utilizes the faces of bald children in an effort to continue to build your revenues. ACS has confused consumers who may not be completely aware of these facts. ACS continues to accept tremendous sums of money from amazing people through events like Relay for Life who may believe they are raising money for childhood cancer. Focus on adults and let others in the childhood cancer community continue to do the amazing work that is necessary to save our children. ACS has done and continues to do amazing work on behalf of the adult cancer community. To John R. Seffrin, the CEO of ACS, I am available anytime for a conversation on these issues. I am awash with ideas how to help. I will wait for your call. This entry was posted in Cancer, Childhood Cancer, Pediatric Cancer, Rare Disease, Uncategorized and tagged ACS, American Cancer Society, John R. Seffrin, Jonathan Agin. Bookmark the permalink.